Where: Dunkin’ Donuts Center – Providence, R.I.
PROVIDENCE, R.I. –Arkansas will play at Providence College in the opening round of the 2019 National Invitation Tournament on Tuesday (Mar. 19). Tip-off in Providence, R.I., at the Dunkin’ Donuts Center is set for 9 pm (ET)/8 pm (CT) and the game will be telecast on ESPN2. This will be the fourth meeting between Arkansas and Providence. The Friars own a 2-1 advantage in the series. 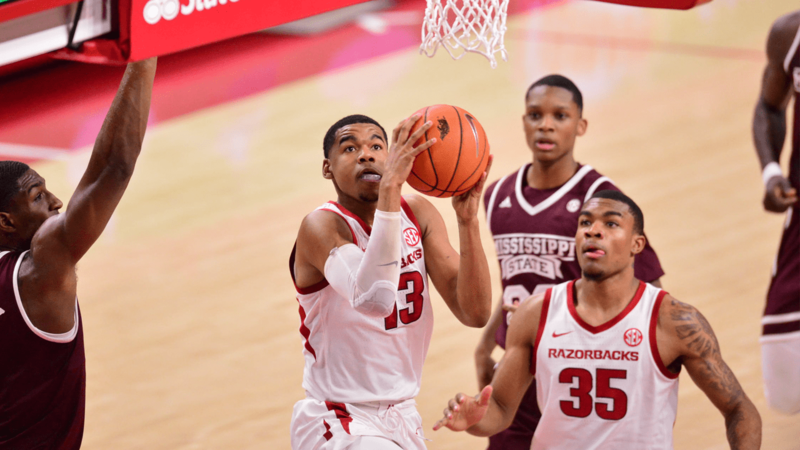 Each team has won on their home court (Arkansas won in Fayetteville, 118-79, in 1999 — Providence won at their home the following season, 87-81). The Friars broke the tie-breaker with a 67-51 win in the 2007 Puerto Rico Tip-off. This will be the fourth trip to the NIT for the Razorbacks and Arkansas is 5-4 in the postseason tournament. Arkansas went 1-1 in 1987. Arkansas was 3-2 in 1997 and reached the Final Four. The Razorbacks lost in the semifinals, then lost to UConn in the consolation game. The last time Arkansas went to the NIT was 2014 and the Razorbacks were 1-1. In this the eighth year of the Mike Anderson era at Arkansas, the Razorbacks are playing in the postseason for the third consecutive year and the fifth time in the last six years. (NCAA in 2015, ‘17 and ‘18 and the NIT in 2014 and ‘19). This is Coach Anderson’s 12th postseason appearance in 17 years as head coach, including nine in the NCAA and three in the NIT. Overall, this is Arkansas’ 37th postseason berth, including 34 in the NCAA and three in the NIT.